It’s been a while since I did a theatre review, mostly because what I’ve been to see hasn’t really moved me to review it. 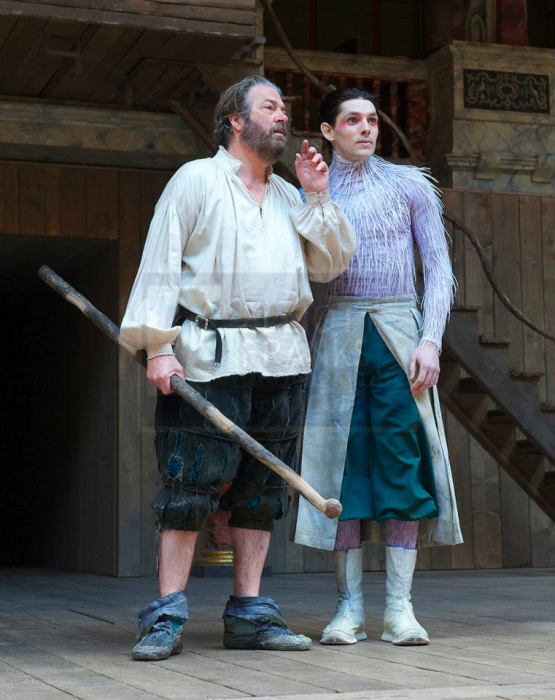 But, of course, Colin Morgan at The Globe was always going to get a review! I have actually wanted to go to The Globe for quite a few years now and, for one reason or another, the opportunity never presented itself. So when I heard that they were staging The Tempest (one of my favourite Shakespeare plays) featuring Colin (my favourite actor) it was going to take the arrival of the four horsemen of the apocalypse to stop me from going. And they wouldn’t have found me an easy target either. Firstly, I have to say that the entire cast was amazing. Quite often, I’ll see a play and always pick out one duff performance that bugs me. But with this one, for me, every single person was perfectly cast and gave the most beautiful performance. Neither can I adequately express how perfect The Globe is. I’ve been to RSC at Stratford and, even though I enjoyed my visit immensely, it felt quite elitist, in some ways, more reserved. It felt like somewhere I had to behave in. The Globe feels like I’m sure it would have been in Shakespeare’s day: welcoming, levelling and merry. It feels like a place where friends would have got together to be entertained and to have a laugh. There seems to be more of an ethos of Shakespeare being something for the masses to enjoy, rather than for people with English degrees. The atmosphere was fantastic and if you haven’t been and get the chance, you really must go. So, what’s next? Oh yeah, tumbling and swinging! Colin, as Ariel, did a lot of that. He cartwheeled across the stage, hung from beneath stairs with one arm like a monkey, climbed up staging and walked on funny stilt things. It was pretty impressive. All that and he still managed to deliver his lines! And that was pretty impressive too. I wasn’t sure what to expect from him for Ariel. As you may know, it’s not the first time I’ve seen him on stage and the last role was very different from this. I’ve seen The Tempest performed before too and, if I’m honest, the last time I don’t recall Ariel being a character that had much of an impact on me. Colin made his Ariel a strange mix of childlike naivety, jester, powerful spirit, nimble nymph, camp flirt and cheeky monkey! There were moments where he was like a little lost boy: the point at which Ariel asks Prospero if he loves him drew a collective sigh from the audience that very likely could have been heard from the Mir space station. And there were moments where Ariel really showed his power, like when he appears as a vengeful harpy to pronounce judgment on Prospero’s enemies. You’ll be happy to learn that the reports of his singing are well founded too – he can actually sing and it’s rather lovely! One moment where he sings and almost breaks down crying – oh, my heart! I loved the costumes. They were inventive whilst still keeping to the ethos of not being over-produced; I loved the kind of rustic-ness about them. Some of the actors came into the crowds during the performance and I loved seeing the costumes up close for that reason. It reminded me of school play costumes, but in a really good way. It all added to the feeling of a sort of social accessibility around the theatre itself. Eek, someone is going to comment now and tell me they cost millions to produce! The same can be said about the props. The iconic stage was barely dressed at all, so that most of the setting came from your imagination, but what was done was really clever. Caliban first emerges onto the stage from a hole beneath a rock and the shipwreck at the beginning is done by actors carrying a model ship through the crowd as though it was a heaving sea. There was one funny prop malfunction moment where Ariel had to tie a washing line up between two posts. The line was clearly stuck on something and wouldn’t stretch. He tried twice but it wouldn’t budge, so he tripped off the stage very professionally and the washing had to stay in the basket! This production definitely felt more humorous too than the one I’ve seen before. In fact, there was a lot of laughter and the audience clearly loved the jokes. There was one ongoing one where Trinculo keeps pulling fish from various parts of his jester outfit and they get bigger each time. And then there was a little wedding dance for Ferdinand and Miranda where the spirits joined in and that was just hilarious. There was another dance right at the end of the play where all the characters joined in and that was such a feel-good moment that everyone was just smiling their heads off and even the actors looked as though they were having the time of their lives. Of course, I was just mesmerised by Colin’s little version of the dance – just the cutest thing ever! I’m just so happy that I got to see this performance but I think I need to go again! If you fancy seeing The Tempest for yourself, here’s the link. Tickets start at £5, so what are you waiting for? Mister doesn’t like Shakespeare, so I was left to do this one with Mister’s brother and his wife. Mister’s brother had never seen Shakespeare performed before so this was really a voyage of discovery for him. This production was staged by a company called Page 2 Stage. 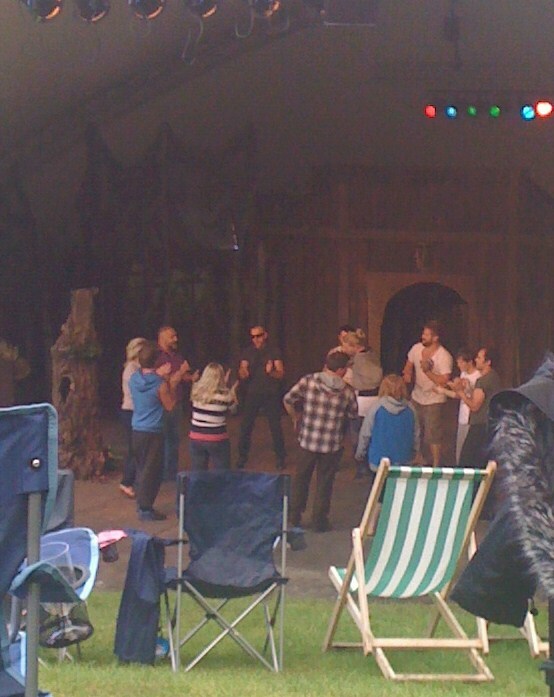 I had actually never seen Shakespeare done in a setting like this before – it was performed outside in the gardens while the audience sat with camping chairs and picnic baskets and layers of blankets to fend off the freeze of a British summer’s evening (although, not so many blankets for foolish, unprepared me, just frostbite). We arrived early so we could get a good view (but, as you can see from my usual ‘quality’ photos, we were thwarted despite our efforts). The interesting outcome of this was that we got to see the company warm up before-hand and, personally, I found this whole ‘nuts and bolts’ behind the scenes sneaky peek fascinating. I didn’t really know what to expect from a small and fairly new company, and with tickets at £12 a head, I don’t imagine their production budgets are huge either, but I was pleasantly blown-away! It was a very youthful company and a vibrant and youthful production, fast paced, comedic and fun. Romeo and Juliet weren’t the earnest, angst ridden couple that I have seen in some productions, but flirty and irreverent; there was a humour to the characters that drew you in, made you love them so much that the tragedy of their eventual demise was all the more poignant. The trio of Romeo, Mercutio and Benvolio were absolutely hilarious together – the three performances witty, energetic and sometimes camp, a lovely three-way bromance. I really liked the Nurse too. She is always a funny character and quite rude, and this particular incarnation had all that, but also tenderness with Juliet. All that said, there were one or two dodgy performances, but thankfully, only from fairly minor characters like the apocathery, so although you couldn’t help but notice them, it didn’t detract too much from the magic of the central performances. There were some interesting production points too. It was set in a forest. 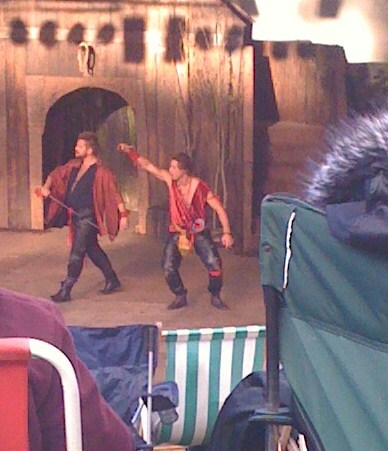 The play programme explained this as making the two warring families seem less about money and titles and more about simple honour, but I suspect the real reason for this setting was the fact that the company were also staging a production of Robin Hood on alternate nights and the scenery would not need changing (ahem…). If I had more time and money on my hands, I might have been tempted to test my theory. I liked the choice of contemporary music too as a soundtrack to the performance, such as Max Richter’s gorgeous reworking of Dinah Washington’s This Bitter Earth, played during the final death scenes of the play; it served to heighten the emotion and had me crying like the proverbial baby. The costume styling was very fresh and contemporary too (well, circa 1985 anyway as I couldn’t help thinking of Adam and the Ants/ Duran Duran every time Romeo tripped onto the stage) and I liked the splicing of a more traditional Shakespearean costume look with something quite punky. This production wasn’t without it’s faults. I’ve already mentioned some of the weaker performances. There were technical problems with the mics failing from time to time which jarred you back to reality. The Prince was played in a very strange way by a faceless shadowy figure dressed in a gold hooded robe who popped up on the balcony every now and again; there was an echo type reverb thing going on with his voice which just made it so you couldn’t understand what he was saying. The same with Romeo’s dad, who was obviously played by an actor being used in another role, so he wore a red hooded robe all the time and you could never see his face- it just looked weird. But I really enjoyed it and would go to see another production by this company. If they come your way and the tickets are that reasonably priced, go check them out – (here is some info about them from This is Staffordshire).